In the 1950s, you could enjoy a slice of coffee crunch cake (then called koffee krunch kake) at Blum’s historic soda fountains around the city. Sock hops may have fallen by the wayside, but you can still find a near perfect replica at Yasukochi’s. 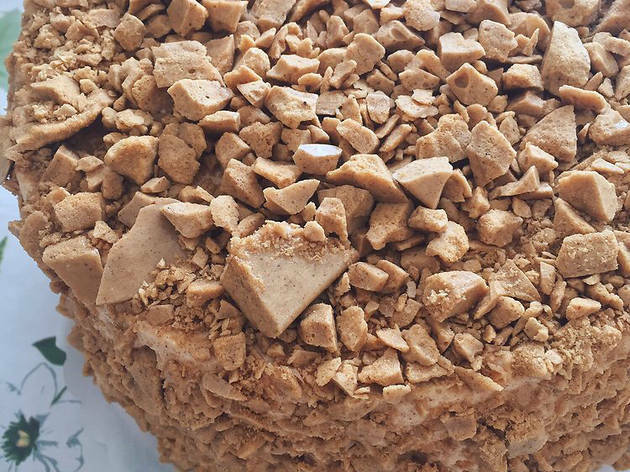 Tom Yasukochi has operated out of one corner of a Japanese supermarket since 1974; for over forty years, his coffee crunch cake has had devotees calling days in advance to reserve a slice. 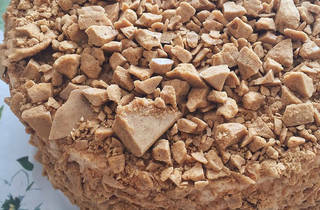 It’s easy to see why: fluffy, lightly sweetened sponge cake is layered with fresh whipped cream and topped with “coffee crunch,” a crumbly, caffeinated, highly addictive candy reminiscent of honeycomb.